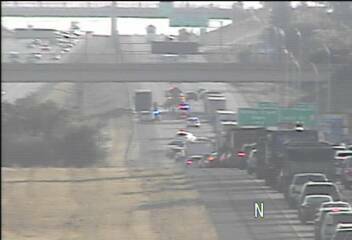 The traffic jam on northbound Interstate 494 is shrinking, but delays persist due to a left lane blocking truck that caugh fire earlier Friday morning at Lake Road in Woodbury. The jam up extends back to Carver Avenue at 9 a.m.
Backups have dissipated on westbound I-694 in the vicinity of Hwy. 61 where an earlier tanker fire created big backups. At 9 a.m., the tanker was still parked on the right shoulder. 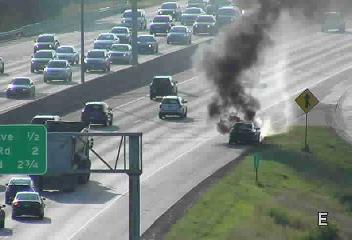 The third vehicle fire of the morning has been extinguished on eastbound I-694 at Main Street in Fridley. This is what it looked like earlier. Traffic has recovered and is flowing near freeway speeds at 9 a.m. Elsewhere minor congestion is in place along the I-494 strip in Bloomington and northbound I-35W from Crosstown to downtown Minneapolis. The west metro is looking just fine, with no major issues on Hwy. 169 through Plymouth, Edina and Minnetonka. 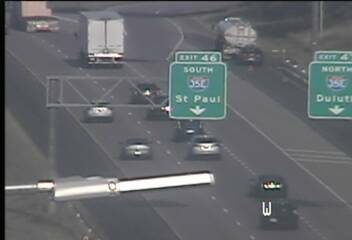 Highway 100 is moving well, too, but expect a dip in speeds on the southbound side from I-394 past a crash near Excelsior Boulevard.